The top three players in the global hip replacement market, collectively, contributed 74.7% of the overall revenue generation of the market in 2015, indicating towards consolidated nature of this arena. These players are Johnson & Johnson, Zimmer Biomet Holdings Inc., and Stryker Corporation. Transparency Market Research (TMR) observes that strong portfolio, high geographic outreach, and strong brand recognition are some of the factors contributing to the dominance of these companies. “Key players are aiming towards expanding their product portfolio through acquisitions and research and development activities for development of new products and improvement of existing products that significantly contribute to revenue growth,” says TMR’s lead analyst. 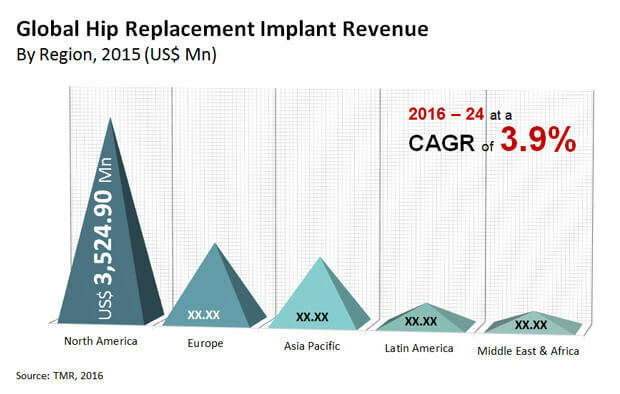 The valuation of the global hip replacement implant market was US$6.76 bn in 2016 and is expected to reach US$9.18 bn by the end of 2024, rising at a CAGR of 3.9% therein. On the basis of product, the total hip replacement implant segment will continue to dominate the market until 2024, accounting for over 58% of the overall market revenue. The growth of the segment can be attributed to the growing prevalence of osteonecrosis and osteoarthritis. Total hip replacement implant is poised to expand at a noteworthy CAGR during the forecast period, making inroads into the shares of other segments. Geographically, North America will represent the lion’s share in the overall market revenue throughout the review period. The widening base of geriatric population and rapid advancements in technology are stoking the growth of the region. Asia Pacific, on the other hand, is likely to post a CAGR of 4.8% during the same period, which will be higher than any other regional market. The growth of APAC can be attributed to improving healthcare infrastructure along with the increasing consumer spending on healthcare. Over the last decade, the incidence of accidental injuries and hip bone disorders such as joint pain, bone loss, and instability in the hip joint has increased drastically. This is providing a significant momentum to the global hip replacement implants market. The rapidly aging global population and rise in clinical education among patients are also playing an imperative role in the growth of the market. “Over 340,000 hip implant procedures are performed in the U.S. and 600,000 are performed across the globe every year. This pool includes a raft of patients aged between 40 and 50 who are focused toward maintaining a healthy lifestyle,” says a TMR analyst. Moreover, improvements in minimally invasive surgeries coupled with advancements in the 3D technology are providing a fillip to the global hip replacement market. Furthermore, the advent of advanced and custom made hip replacement implants is positively influencing the global market. Lack of affordability is one of the major issues faced by patients willing to undergo hip replacement procedures. Besides high costs of implants, the lack of reimbursement policies is impinging on the growth prospects of the global hip replacement implants market. Moreover, the increasing number of cases of hip implant product recalls is compelling the FDA to propose stricter regulations on all metal hip implant products, which in turn is adversely affecting the growth of the market. However, the presence of a large pool of patient in developing countries is creating ample growth opportunities for the market.